opinion Over the past several weeks, there has been a great deal of speculation that Amazon’s Web Services division will launch a new datacentre located in Australia. To a certain degree, the speculation is well-grounded. The company has launched an Australian office with local staff (although we don’t know where, or how many local employees it has), last week it held a moderately sized series of roadshows in Sydney and Melbourne to talk to local customers, and Amazon CTO Werner Vogels has even been out pressing the flesh with startups (at the Fishburners office, for example) and students (at the University of Technology Sydney). And above all, there was a report from the AustralianIT last week stating a local Amazon datacentre was on the cards to be unveiled by early 2012, with up to three sites in Sydney on the selection list, and one datacentre provider being Equinix, which has a substantial chunk of datacentre facility in Australia and is building more. Amazon itself did nothing to really dispel the rumours, with both its regional Web Services chief Shane Owenby and Vogels himself talking up the company’s commitment to the local market and their interest in local infrastructure. However, I think it’s time for a bit of a reality check about what Amazon might really be planning to build in Australia — and why. To start with, it’s important to examine Amazon’s existing global network. Vogels himself put the pictured slide up during his presentation in Sydney last week. What it demonstrates is that Amazon currently has two different ways of classifying its infrastructure located around the world. For starters, it has what it describes as its ‘regions’. Although most customers are still using Amazon’s US infrastructure, implementing ‘regions’ over the past year or so has given Amazon customers the option to receive better latency and potentially redundancy by using services from multiple regions. It also gives some customers concerned about regulatory certainty the option not to host data in the US, with its tricky Patriot Act. It appears as if each of these regions is served from a centralised datacentre. The US East and US West datacentres tackle the Americas (including Canada and South America), while a datacentre in Irish tech centre Dublin serves customers across Europe. The Asia-Pacific market (including regions like Hong Kong, Malaysia and Australia) is serviced from Singapore, while Japan gets its own datacentre — which we’re sure some Chinese customers also use. Now, each of these regional datacentres is believed to be quite large. An article published by very useful site Data Center Knowledge just last week tells us just how large they are — $88 million per month for 8MW worth of electricity? 46,000 servers? That’s a lot of power and floor space. And Amazon is adding to that space continually … every day the company adds the same amount of new capacity that it used to support all of its global infrastructure throughout its first five years — when it had $2.7 billion in annual revenue. So these are the big kahunas of the Amazon world. But the company also has a second set of smaller infrastructure assets — consisting of its edge network. On the image above, you can see that clustered around the main Amazon ‘regions’ are smaller sites located in other countries — France, the Netherlands, Hong Kong and so on, as well as many states in the US. These sites are likely much smaller than Amazon’s main datacentres, and they appear to act mainly as the company’s content distribution network — efficiently funnelling content out from Amazon’s core to other regions. Amazon has commercialised this model under its ‘Cloudfront’ banner. Now here’s some other interesting information. 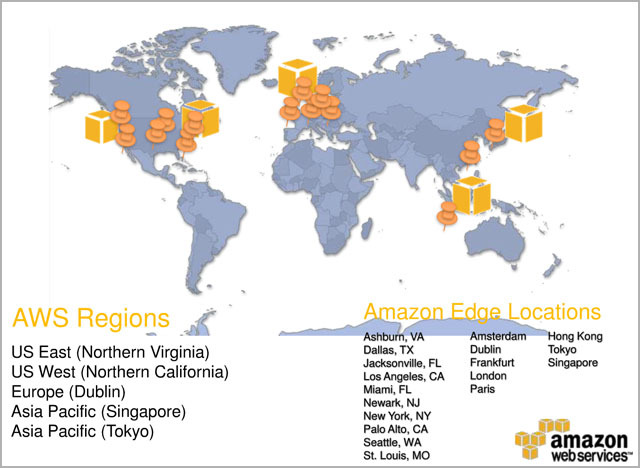 It was only in April 2010 that Amazon added the Singapore datacentre. We still don’t know where that facility is precisely located — whether Amazon is renting datacentre space or built its own. However, given Equinix’s existing facility in Singapore and the rumours of an Equinix partnership in Australia, we’re betting Amazon’s Singapore facility is hosted with Equinix — and it’s not as large a facility by any measures, compared to the sites Amazon has in the US. It’s also possible that Amazon merely plonked a few of those datacentres in a shipping container that it seems to like so much down in a secure Singapore facility and is providing services efficiently that way. Either way, if you examine Amazon’s current infrastructure it doesn’t appear to make much commercial sense for the company to build any form of substantial new datacentre in Australia. Secondly, if you look at the above image from a population point of view, it’s apparent that there are vast — and growing — regions which are not well served by Amazon at all, currently. India, China, Russia, even South America. None of these countries have much local Amazon infrastructure, despite the fact that they are much, much larger than Australia. It would make much more sense, if Amazon is planning to expand internationally, for the company to plonk down major new datacentres in these regions first, rather than targeting Australia. All of these geographies, after all, offer an incredibly larger addressable market than Australia does, and most don’t even have Amazon ‘Edge’ facilities yet. For Amazon to invest in a new Australian ‘region’, when there are no regional facilities in countries like India, with its massive population of 1.1 billion and a burgeoning IT industry, just sounds ludicrous. Sure, Australia punches above its weight when it comes to consuming cloud computing resources — but does it punch bigger than India? Not really. I would consider it much more likely that what Amazon is planning for Australia is to build a small ‘Edge’ content distribution facility locally, to bring us into line with locations such as Paris and London. That would make a great deal of sense, considering our appetite for consumer online services, particularly media. This would also play well into Amazon’s existing local customer base. Several of the local customers which Amazon outed last week are media players, who serve either quite a lot of content locally to Australians (in the example of the Melbourne Cup’s web site) or globally (in the example of artist commercialisation site RedBubble). It would make sense for Amazon to establish a CDN node in Australia to serve these media players, whose businesses are more about distributing traffic. Amazon does have customers in Australia with actual high-end processing requirements, rather than traffic distribution needs, but I’m betting companies like Kaggle and Cyclopic Energy don’t actually care whether their processing is done — they just want it done as cheaply as possible. There is the possibility that Amazon will create in Australia what I would term a ‘hybrid’ model of datacentre. It might combine its basic content distribution network model with a small amount of extra processing and storage space, so that it can gain a toehold in the local market and start discussing options with the local chief information officers that Vogels was so keen to discuss last week. This would also make sense, as these corporate customers are likely to be pretty high value for Amazon compared with the money it’s getting from websites like RedBubble. However, obviously Amazon will still likely be able to undercut the likes of Telstra, HP, Fujitsu and so on when it comes to providing basic processing and storage services for this kind of user. I’d bet that a local ‘hybrid’ Amazon model would suit some enterprise customers well, for a cheap way to host their internal testing and development operation. Again, a good way to do this would be through an efficient datacentre in a shipping container install. In conclusion, don’t believe the hype. There’s simply no way that Australia will see an Amazon datacentre presence consisting of anything like the same scale that the company has deployed in the US, Europe, or even Japan. What we will see is likely something like Amazon Edge, plus a little bit on the side. Datacentre rollouts are more complex than headlines would make them out to be — and so are commercial decisions for a company as big as Amazon Web Services. I tend to agree. For some reason Australia has never been all that popular for data-centre deployments. For that reason the cost of hosting anything in Australia is significantly higher than anywhere else in the world. Bandwidth costs seem to be the biggest problem. It is rather annoying that here you can only get a VPS with 100GB or so of monthly traffic and for the same price in Los Angles you can get a VPS for several TBs of traffic. Also most of the time you can only seem to get 10Mbps links, whereas in the US and Singapore the standard is 100Mbps. It honestly doesn’t make all that much sense to me as to why the cost of information based services is so expensive here, even when you take into account the sparseness of our population centres. This isn’t meant as a criticism of your article Renai, but why would we care if they build a full scale DC here or not? Are you saying it would be good for the local IT industry if a company the size of Amazon made such a commitment? Just curious, you seem to have done a good deal of research/thinking for this article, so I fear I am missing some important point!! It would presumably depend on final pricing as to whether amazon having a presence would be ‘good for the local IT industry’. It could be argued either way (I’m sure existing infrastructure and hosting providers aren’t begging for extra competition from a global player) but for startups, software and solutions providers having an affordable, reliable and high performance product to compute and serve data would have to be of benefit I would have thought? Yes, I think it would be good for the local IT industry. We have a relatively open market here, and competition stimulates innovation and better price and service outcomes for end users. Well researched. I like that you mention the Patriot Act. I’m sometimes aghast at how lax major corporates (like banks) are about information stored overseas and transited sans any kind of crypto wrapper. I’ve also had enough of US –oriented T&Cs. I’m not aware of any DC in Australia that’s offering a PaaS layer for developers or IaaS management (a la AWS) for virtualised instances so anticipating local Amazon Web Services is like anticipating the arrival of Easter bunny (and I’d reckon Heroku and others would follow to provide that developer platform). Agile matters. Round-trip times matter and jurisdiction matters too. It is why I would never host any of my sites outside of Australia, let alone the US. The US hosting plans are generally cheaper, but I’m happy to pay a little extra to keep the work in Australia, and keep them in a location I won’t have to face potential foreign government policy/interference. There are plenty of providers who offer the OpenStack APIs (aka RackSpace – which are mostly Amazon compatible). OrionVM, Rejila, CloudCentral etc. US prices are roughly 50% lower. Thanks for the responses guys. I guess I was thinking of some of the local players like Next DC, who are pumping lots into DC space and wondering if this would have them crapping themselves!! They shouldn’t be crapping themselves. DC space has been scarce in recent years, and with the movement to the cloud, there will be plenty of market for rackspace. Amazon has been asking local customers about location, currencies to be billed in and the importance of location.